This weekend, the FAA released its proposed rules regulating the use of small Unmanned Aircraft Systems (drones). Today, I worked through the full, 200-page document, so that you don’t have to. These regulations, which are 3 years in the making and soon to be open for public comment, would determine who could fly, what licensing is required, and what limits would be imposed on drone flights. The regulations are pretty fair and leave open plenty of room for amateur enthusiasts while charting a way forward for commercial operators, but there are some glaring oversights and some unnecessary (and ineffective) security steps. I’ve written extensively on the used of drones for marine science, so my big question is: How will these rules impact drone use for research and conservation? How many times are you going to use this image, Andrew? Before I get into specific research and conservation applications, here is my general impression of this proposal. Overall, I think it’s good. Most of the suggestions are reasonable and not unnecessarily onerous. I particularly like that there could be a special exemption for microdrones, so your tiny Hubsan x4 wouldn’t be treated like the massive and mighty Aerotestra IVAN. I’m a big proponent of ensuring drone operators have the proper knowledge base, so I actually like the requirement for a comprehensive knowledge test, which will be separate from and less expensive than a full pilot’s license. I like that there’s no requirement to certify the “airworthiness” of drones as if they were 6000+ pound aircraft (the certification process take 3 to 5 years and drone tech moves so fast that by the time one was certified, it would be several generations obsolete). I also really like, and I’m sure I’ll get some flak from other drone enthusiasts about this, the requirement the operators maintain visual line-of-sight–that is, you have to be able to see your drone at all times. Operators can use spotters, as long as those spotters are close enough to maintain communication (but you can’t daisy chain spotters to increase effective range). Drones can be dangerous in inexperienced hands, and keeping them within visual range limits how far afield they can wander and increases the operator’s ability to monitor both the drone and the flight environment. Here’s what I don’t like. There’s a requirement that drone users go through a TSA background check before being certified. On one hand, this will add extra expenses to drone operators and add an extra 6 to 8 weeks to the certification process. On the other hand, it does nothing to improve national security, because, and this is key, there are no restrictions on buying or building drones, only flying them, and then, only commercially. “Model aircraft” which now include drones flown exclusively for recreation purposes have their own guidelines for operation, and if someone really wanted to violate national security (or, say, a drunk government employee) would simply not apply for a commercial license. Which means the only thing a TSA check would accomplish is trapping a few honest drone operators in bureaucratic limbo because their name is similar to the same of someone on some classified list. That bothers me, and it bothers me for more reasons than the lack of transparency. The vast majority of commercial drone users are almost certainly going to be photographers, many of whom will not be full-time photographers, but will, like many freelancers, be supplementing their income. Which means that they can make a reasonable case for operating a model aircraft recreationally and skip the whole certification process. The more complex and onerous the process, the more people will try to find loopholes to get out of it. I want drone operators to be safe and responsible. I’d actually prefer that all drone operators (microdrones excepted) undergo a basic safety course, much like most state require boaters to take a US Coast Guard approved boating safety course. If it could be done online, that’s even better. A TSA review (and I’m not even sure how the TSA would have purview over unmanned aircraft flown within line-of-sight of the operator) would simply discourage a subset of drone pilots from pursuing certification without adding any value to national security. A few other bits of the proposed rules rubbed me the wrong way. The minimum age is set at 17, which would be reasonable except that you can get an ultra-light/glider aircraft license at 16, which is for an aircraft hurtling through the air with an actual human strapped to it. There’s a requirement that all drone operators speak English, which seems fairly pointless (English might be the language of international aviation, but drone operators aren’t chatting on the radio with passing commercial jets). Also, it’s the 21st century. Are we seriously defaulting to “unmanned”? Seriously? This is, for the most part, good news for research and conservation. A commercial license would cover most research activities and government agencies and universities can apply for special dispensation (though, in the proposed guidelines, most of the language related to “research” was specifically about aviation research–research to figure out how to make drones fly better). One clause specific to marine science and conservation was a relaxation on the moving vehicle restriction for drone operators. Generally, drones cannot be flow from a moving vehicle, the operator must be stationary. The one exception is boats. Drone operators working from a boat and allowed to be in motion (though, obviously, not driving the boat). This greatly extends the operational range for boat-based surveys and allows drone pilots to survey long stretches of coastline while keeping the drone in their line-of-sight. There is one glaring oversight, however, in that the proposed regulations make no provisions for autonomous flight. Autonomous operation is mentioned only once, on a table indicating that it will be allowed. Autonomous flight dramatically changes the relationship between the aircraft and the operator and is an essential component of ecological surveys, allowing drones to fly straight transects and pinpoint sampling sites. These regulations forbid dropping anything from a drone, which is totally reasonable. Unfortunately, I have a dream of one day flying an OpenROV out to sea, deploying it from the drone, and controlling it remotely over WiFi. I’ll probably need a special exemption for that. 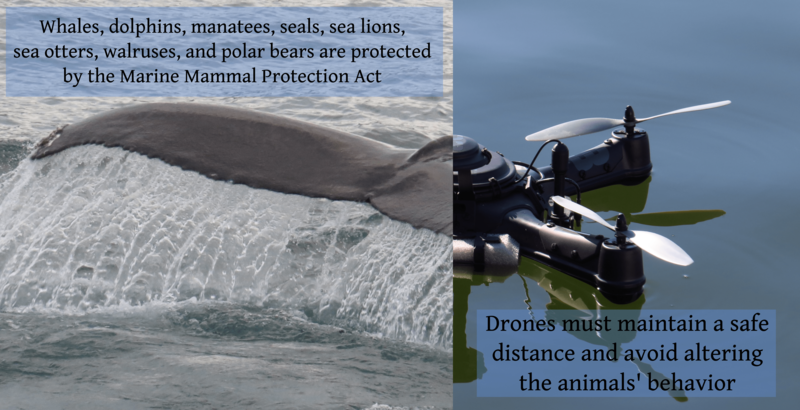 My original assessment of drones and the Marine Mammal Protection Act still stands, until NOAA and NMFS revise their internal policies. The new rules put the brakes on a few novel, innovative conservation programs, including a plan to have “listening drones” that detect the sound of chainsaws and then autonomously fly to the noise and photograph illegal logging in Redwood forests (those drone would be far from an operator’s line-of-sight). They also forbid flying drones at night, so plans to track poachers would be off the table. Overall, these regulations are a much needed (and much delayed) step in the right direction and will promote responsible drone use. This proposal is open to public comments, so make sure to let the FAA know how you feel.